We're back once more in the non-stop world of home security cameras today, taking a look at another option for protecting all your stuff while you're out. Kidde is a new brand to us, but they're very well known in the States for making smoke detectors (and for being pronounced “Kidder” apparently). Today, however, we're checking out their new Remote LyncCamera. Here are your headlines: this is a ball-shaped camera which connects to your home WiFi network to send you alerts and clips if it detects motion while you're away. 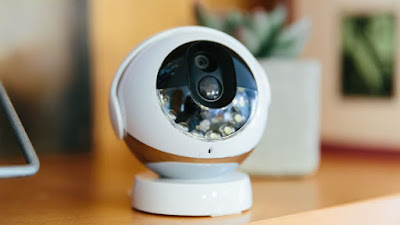 It sounds pretty much like all the other home security cameras we review... with the notable exception of having the lowest resolution of any WiFi camera we've ever seen. Yep, had to pull that plaster off quickly. The Kidde Remote Lync Camera records video in VGA quality, so that's just 480p. Normally we berate a camera for using low-end “HD” 720p, so already alarm bells are ringing. However, those alarm bells soon stopped when we worked out why the cam has compromised so much on video quality: flexibility and battery life. ssThe Kidde Remote Lync Camera doesn't need a wired power connection, unlike 90% of other WiFi cams. It features an on-board rechargeable battery which is charged via a Micro USB port on the back. Furthermore, it magnetically attaches to a small base which can either sit happily on a flat surface, or be stuck to a wall with adhesive strips. The cam firmly attaches to the base, and you can swivel it around to get the correct line of sight. Oh, and the battery lasts for up to three months. Which is a pretty big deal. The Kidde Remote Lync app is nice, being clean and easy to use. You can set the cam to respond to motion manually, or set a geo-tag mode which will activate the moment you leave the house. 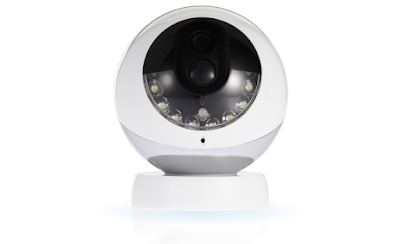 If motion is detected (using the cam's infrared sensors) it will send an alert to your phone, allowing you to view the snippet of recorded video that captured the event. After that you can either save it for 12 hours or just download it to your phone. Viewing the captured clips on your phone is fine, as the lower resolution footage looks okay on a smallish screen. You won't be able to count the hairs on an intruders face, but it is clear enough to get a positive ID on someone. So there is your compromise: do you favour video quality over flexibility and ease of use, or do you just want to quickly whack a camera somewhere there isn't a power supply? If you're more bothered about the latter – and remember the wire-free ability of the Kidde Remote Lync Camera means it can go anywhere in range of the house WiFi, so even out in the garden shed – this is a sound choice.